Our initial goal is to rapidly relieve as much of your pain as possible. The Rapid Pain Relief Phase starts with your first treatment. Treatment sessions usually include chiropractic adjustments, Cold Laser Therapy, various assistive therapies, and DTS Spinal Decompression Therapy. Throughout your treatment phases, Dr. Bailey will provide chiropractic adjustments to correct spinal dysfunction causing nerve interference to the nervous system. This nerve interference is the cause of pain and weakness. 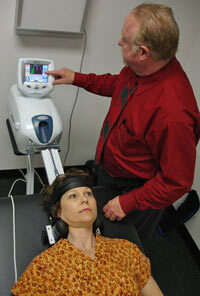 Dr. Bailey also uses Erchonia cold laser treatment to assist in pain relief and energy balance in the body. Cold laser treatment helps provide rapid pain relief and helps restore the body’s ability to heal itself. Your DTS Spinal Decompression Therapy is performed on a specially designed table. You either lie in a face up or face down position. Clinical consideration and your comfort are used in deciding which position will be best for you. You may begin in one position but in later sessions, it may be necessary to change positions. You will remain fully dressed during the treatment though we recommend wearing loose fitting clothes, and removal of your belt and objects from your pockets. We also suggest not having a large meal for at least two hours before treatment. You will be comfortably positioned on the table and fitted with a wrap-around brace. This restraint is what allows the unloading of the spine and discs by the traction motor. Your position on the table, the brace, and angle of the gentle distraction allows for accurate and focused treatment to the affected disc. Once you are comfortable on the DTS Table, the computer controlled traction device is programmed to deliver a gentle stretching force to the spinal vertebra. This force is delivered directly to the brace system. The DTS system applies the gentle force then releases it approximately every minute throughout the session. The total treatment time is usually less than 20 minutes and often just 15 minutes initially. Since DTS Therapy is a comfort-based procedure, patients usually report a sense of relief and relaxation during the session. Many patients even fall to sleep. Healthy discs get their nourishment naturally during daily motions and body positions. This accounts for the increase of disc thickness in the morning and decrease at night. A disc with poor motion is more likely to become injured and painful. During DTS Therapy the gentle stretching and relaxing of the spine causes a pumping action. This is called imbibition and is the natural way to nourish the spinal disc. This pumping action promotes fluid and nutrition intake into the discs, something often lost in damaged and degenerative disc conditions. Dr. Bailey setting up the patient on the Cervical Spinal Decompression machine. Stretching, or traction of the spine during DTS Therapy in a controlled, comfortable manner can help re-establish a more normal feeding of the discs. This can re-supply the disc with nutrients and blood contact that help the disc heal from the inside out. The dramatic decrease of pressure in the disc during spinal decompression therapy can foster the drawing in of a bulge and help take pressure off a “pinched” spinal nerve. Although most patients report dramatic reduction of their pain within as few as five treatments, an injured spinal disc needs time to heal. This is why we urge you to be regular with your prescribed treatments and office visits. Research shows that to heal completely, discs require months to heal. Even though your pain may be gone, you must stay on the treatment in order to keep your spine healthy. As you become more mobile and more able to return to your normal lifestyle, your increased activity is what your spine needs most. As you improve you will begin to feed the discs naturally through improve motion and mobility. Movement is life. Your spine depends on coordinated muscle activity to support your spine. This motion creates fluid movement to and from the discs. Our goal in Phase II is to train your spine to work properly with less pain. If we only provided you pain relief without re-training your spine, your disc pain would return or worsen. Most patients feel significant pain reduction in as few as five DTS Therapy treatments. That however does not mean the healing process is complete, or that your pain will not return. During Phase II of your DTS Therapy treatments, our office will prescribe a series of rehabilitative measures in order to more fully heal your discs, and keep the pain from returning. Most low back pain sufferers have two compounding problems that have contributed to their disc injury and limited their natural healing abilities. A program of focused rehabilitative exercise, with biofeedback, will begin during your DTS Therapy course of treatment. Our rehabilitative program involves several clinically effective yet simple, pain-free activities including primary core stability training. “Core” stability training allows you to monitor and control spinal motion and re-claim proper spinal movement patterns. Strengthening and re-training the muscles that support the spine, and regaining endurance in them, is vital for spinal health. Studies show consistent stabilization and endurance exercises control back pain and reduce injury. As you improve, Dr. Bailey will prescribe the most appropriate exercise plan for you. The goal in Phase III is to prepare your spine to handle your daily activities without pain. We build on the accomplishments achieved in Phase II. During Phase III, Dr. Bailey will structure an in-office and home-based exercise program that will help to bring your spine back to full health. This exercise program will include in-office resistance training, and more advanced “core” exercises. No matter your age or present condition, Dr. Bailey can design a program just for you. Right now you may think this is out of your ability, but by Phase III you will be able to be more active than you can imagine. Regular and consistent home-based exercise is one of the keys to long-term relief and is one of the most important components of healing from spinal disc disorders. Nothing on this site is intended to be used as a substitute for advice of a physician. Do not modify your diet, exercises, or medications without first seeking the advice of a physician. Information on this site is for information purposes only. No claims have been approved by the FDA unless otherwise indicated.